What is the key to world evangelism? All heaven will break loose when God's glory is on display among His people -- to the degree that unbelievers will say: "Wow! This is something else... and we want it!" So what releases God's glory in this dimension? When we understand -- and live out -- the unity Jesus prayed for in John 17:21-22. In Joy Dawson's engaging, conversational, forthright style, she has given us a biblical and through-provoking case for both the need and the how-to, to live in the unity Jesus prayed for. 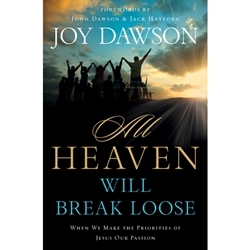 "Joy Dawson is a gifted master-teacher and prophetic voice. In a very real and dynamic sense, this book has been given to her as a 'word from heaven' and should shake us up to act upon it. It has shaken me anew." "Joy's biblical and practical examples of the working of the Holy Spirit are inspiring and truly offer hope to anyone who believes in the power of God to unify the Body of Christ. The tone of humility with which Joy penned this work is a wonderful example to us all."